Do you love potatoes like we do? I mean, could you eat them morning, noon, night, as a snack, for dessert, at 2 am while you're letting the dog out? Cause that's how much we love potatoes around here (except for that man I'm married to. Don't know what happened to him in the potato loving department). I am always looking for new blogs to follow and Facebook pages to stalk like. So when I came across Big Bear's Wife I just had to take a look-see. I mean with a cute name like that, who wouldn't want to see what she's got on her blog. Angie is a very talented lady with some dynamite recipes and you NEED to go check out her blog now! Well, maybe wait till after you read this post, okay? 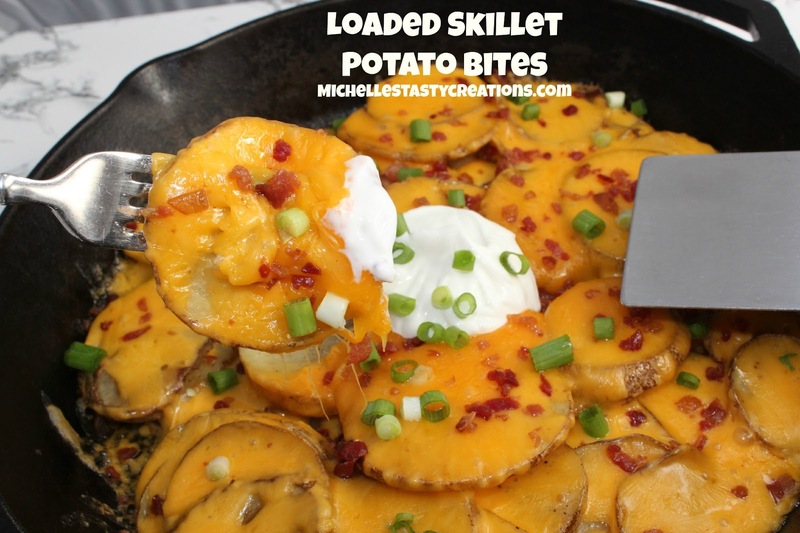 I found this recipe for Loaded Potato Skillet and adapted it slightly to fit what I was in the mood for. Needless to say these were a total HIT and my son ate almost the whole pan full. Wash, pat dry and slice the potatoes. Place into a bowl and toss with the oil, seasoning salt and pepper. Place potatoes in a large cast iron skillet and bake for 30 minutes or until fork tender. Remove from oven when fork tender and add the cheese. Return to oven for 2-5 minutes or until cheese is all gooey and melted. Sprinkle with bacon bits, green onions and sour cream. I'm your newest GFC follower! These potatoes look delicious. What's better than bacon and cheese, right? Come visit me at My Sesame Seed Buns sometime! Why do I want to run to the store and buy ingredients after every single recipe you post?? Oh ya, because you are amazing! I don't always comment, but I always appreciate what you share!